Deployment, adoption and then ….? Social collaboration in organizations has been around under the misleading label of “social media” for a long time. Today people need to go beyond deployment and adoption. Last year’s survey revealed that organizations are just at the very beginning of a long path. When asked “to what extent have social collaborative features been integrated into organizational processes?” only 6 percent of the full survey population said “Quite often. We are rethinking how we do things in many areas”. Encouraging? Definitely yes, but the few examples given by the participants were mainly around using presence indicators and instant messaging, both of which are great because they make work more efficient, but they are not transformational. The same people are doing the same things, but faster. Doing the same things better and faster or doing things differently? How and where should social be integrated? In our fast-moving world of various vendor and in-house solutions, this is a real question. An organization wrote to me recently that in their eagerness to provide social capabilities, they now have two “enterprise” social networks – one for the sales people and one for everyone else. This will decrease the likelihood of cross-stakeholder collaboration: sales people talking to engineers, HR people hearing what sales people experience “in the field”, and so on. This situation has resulted because of (or thanks to!) social capabilities available in more than one platform. Transformational: our ways of working have fundamentally changed. Our processes and/or organizational structure have been impacted. There has been Impact on management practices, customer relations, how we address the marketplace, empowering people. Significant impact: our normal ways of working have been greatly improved by making things faster, easier more efficient. Some impact: we are beginning to see some change in communication and are improving existing procedures and processes. 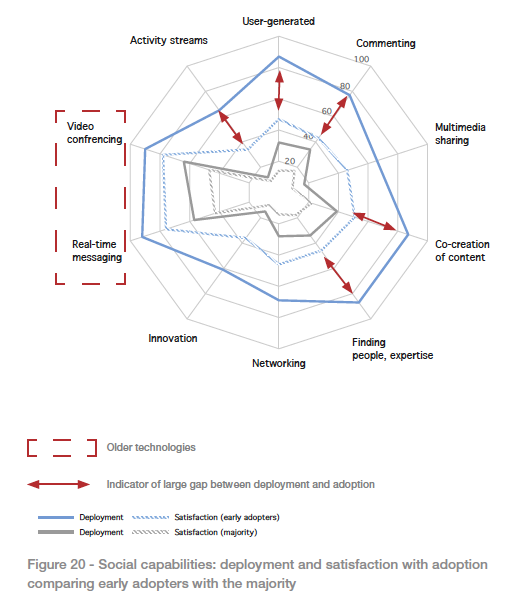 Digital Readiness: Gig Mentality and Living Vision BYOD and High-Performing Companies High-Performing Customer-Facing Workforce and BYOD Transformation goals: present beats future People in the Digital Workplace Working out loud not yet the norm Hacking Work – Bring Your Own… Going social? Don’t create needs. Respond to existing ones.